I never tire of Il Bambino, because quite frankly, warm, comforting pressed sandwiches never go out of style. It's often my go-to place when I'm craving something fast and delicious. And I always look forward to their seasonal soups. Dan and I stopped in impromptu last week for a middle-of-the-day snack and it was so worth it. We split a soup and a panini, which was just enough to satisfy our hunger. 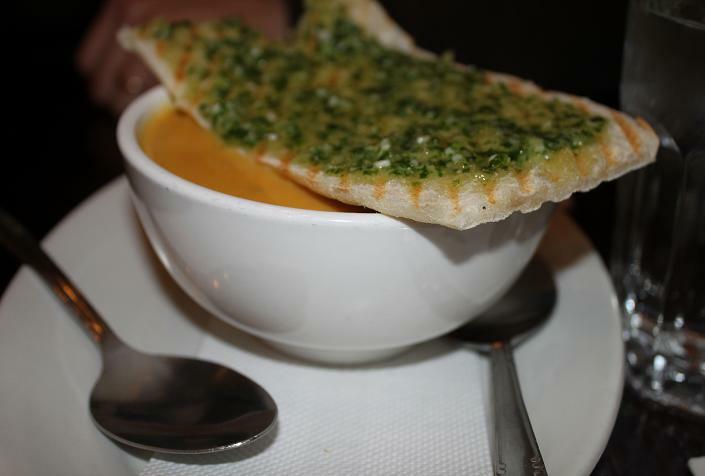 Both of us liked the sharing route since their portions are generous and the soups are always filling. Pumpkin Soup - I couldn't wait to try this soup because I go pretty crazy for just about anything with pumpkin. In their customary fashion, the soup was rich, thick and had an intense pumpkin flavor that can only be achieved from using real pumpkin. The side of crusty pesto bread was a delicious addition, as always, and we broke off pieces and dipped them into the pumpkin soup for extra richness. 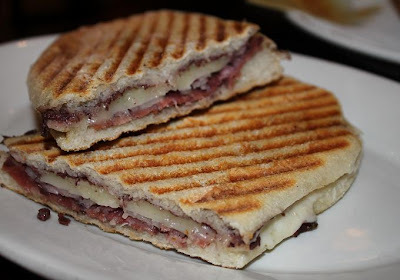 Soppressata Panino - Even though this sandwich was on the salty side, packed with thin-sliced soppressata, provolone cheese, black olive tapenade and sweet red onions, it was really good. My favorite aspect of Il Bambino's paninis is always the bread that's easy to bite into but still provides some toothsomeness. The flavor in this sandwich was a good way to balance out the sweetness left on our tastebuds from the pumpkin soup. We received good service, as our waitress was the right amount of hands-on/hands-off. Since we came at an off-time, the place was quiet and we got to enjoy our soup and sandwich in a relaxing atmosphere - we felt that we can take as much time as we needed. With a grand total of $15 for both the soup and the panino, it was a good deal that left us satiated and definitely up for another visit soon. While tasty, their paninis are simply overpriced for the amount of food you get. $15 for soup and sandwich is a lot! $15 included tax and tip and it was definitely enough for 2 people. I know what you mean about it being on the expensive side, but I think the quality is superb and it's definitely a step up from your ordinary deli sandwich. Sometimes paying a premium for good food is worth it, in my opinion. Il Bambino is amazing, LOVE their crostinis.